This week I managed to finish up another quilt… my Cross Stitch Sparkle quilt finally got quilted and bound….it only took 30 weeks and a friggin ton of half square triangles! This quilt started last year when I agreed to test a quilt pattern for Sara at Knotty Gnome. I love to challenge myself and I had never done anything with half square triangles before so I jumped in feet first. Each block is 18 inches square and I thought I could make a little baby quilt. My original top finish was four blocks by four blocks. But…in a moment of crazy a month or so ago… I thought I would make the quilt bigger and added an additional 5 blocks! I had just cut a whole pile of 4 inch solid squares so I thought why not use some of them. 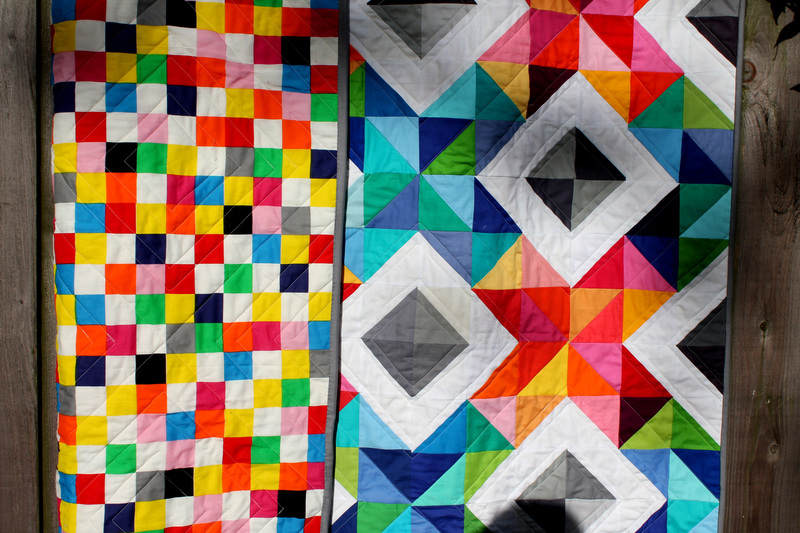 Actually I love this size quilt…I think you really get a great sense of the pattern with the extra blocks added. 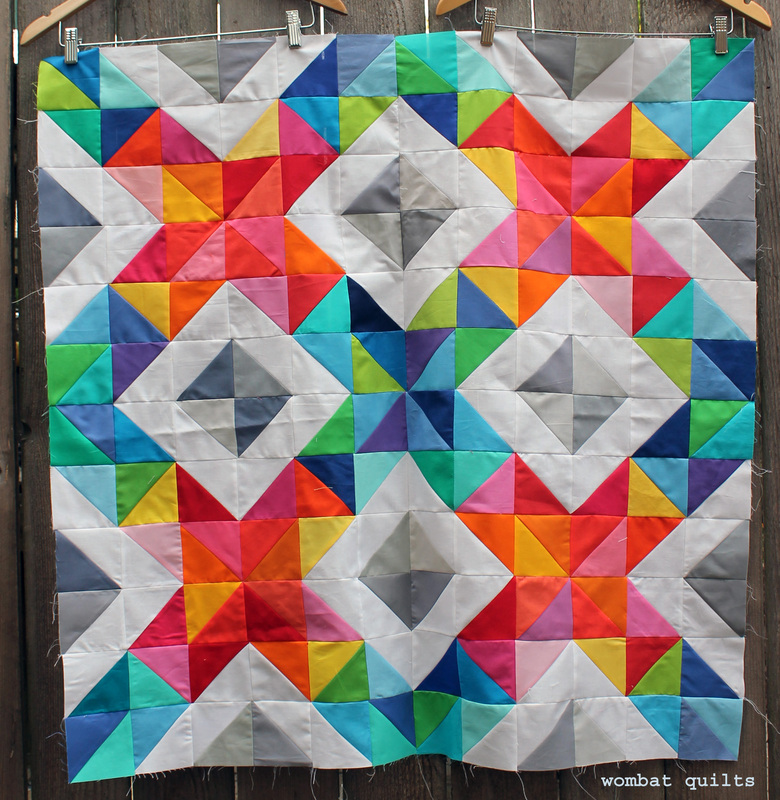 I used so many different warm and cool solids in this quilt. I know I have tons of Kona and Michael Miller Cotton Couture as well as Moda and a sprinkling of American Made in there. Basically any appropriate solids I had in my scrap bin went into this thing. I quilted the top using straight lines on my home machine. For some reason I did not want to quilt it too densely and straight lines echoing the grey center square seemed to be the thing to do. For the backing I used part of an IKEA duvet cover I had in my stash… it was the perfect back for this crazy colourful quilt. Finally I hand bound the quilt using scraps of different greys. 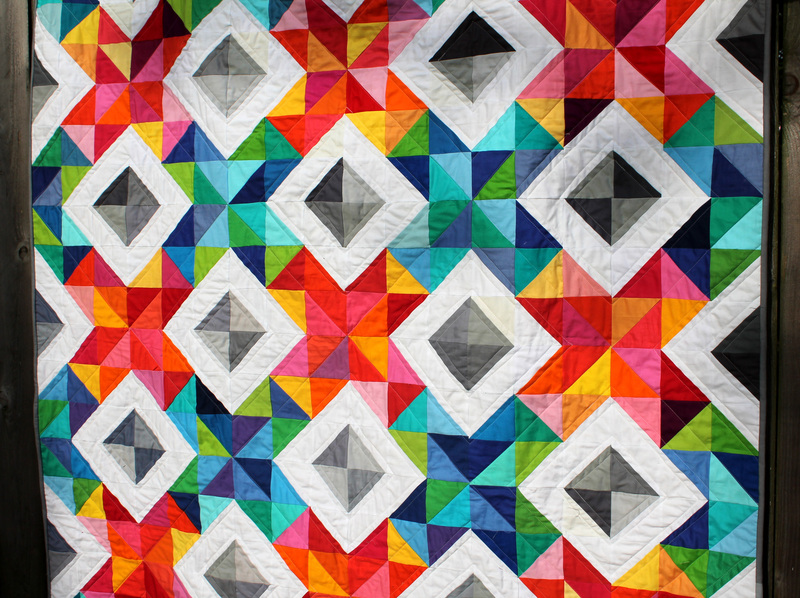 The grey was the perfect way to frame the quilt and contain the colour explosion. « Pink is the new…. So gorgeous! I absolutely love it. And this goes to show the power of the finishing touch of quilting! You know I love solids! And this is a great use of them. I especially like that alternation of warm and cool colors. What a beautiful quilt! 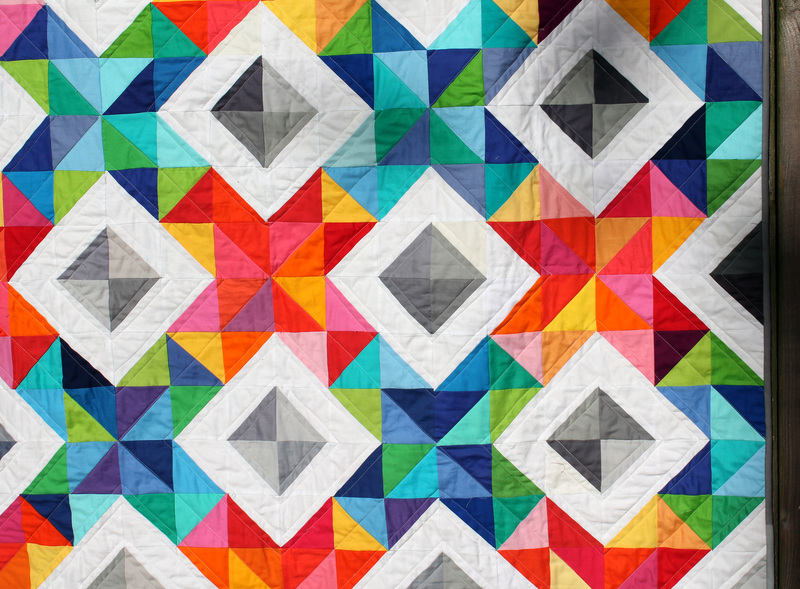 I love how you put the warm and cool colors together, it really gives the quilt a nice pattern. Hi Mel. I choose my IKEA fabric carefully. Some of it is really thin but a lot of it is a good weight. I have backed many quilts over the years with IKEA fabric, including the one I use everyday. I have not had any problems so far, but I would avoid some of the cheaper thinner fabrics. It is hard to resist the fabulous designs of some their duvet covers. 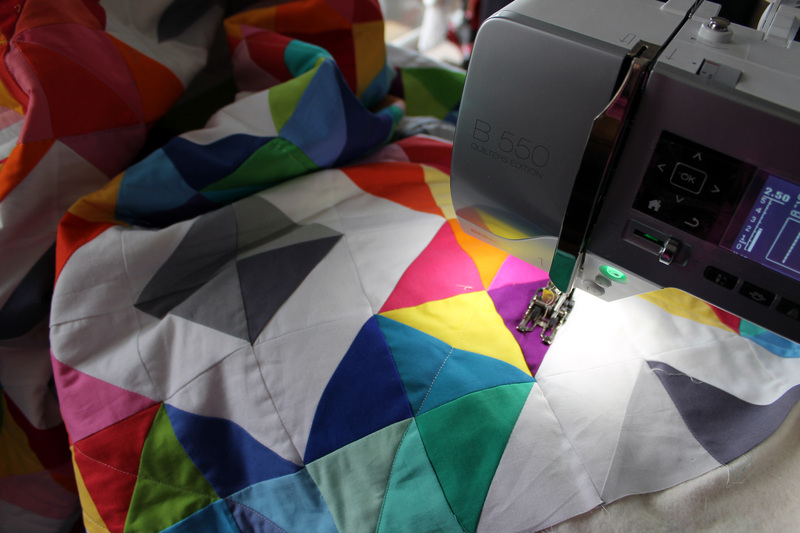 And here I started thinking that the reason the quilt took so long to finish was the pieced backing – that is perfect fabric and had me fooled! 🙂 The warm and cool color changes work so well, and I love how you framed it out in the soothing gray. Great finish! I love how colorful it is! Makes me smile just looking at it. Beautiful quilt. Love the bright colours. 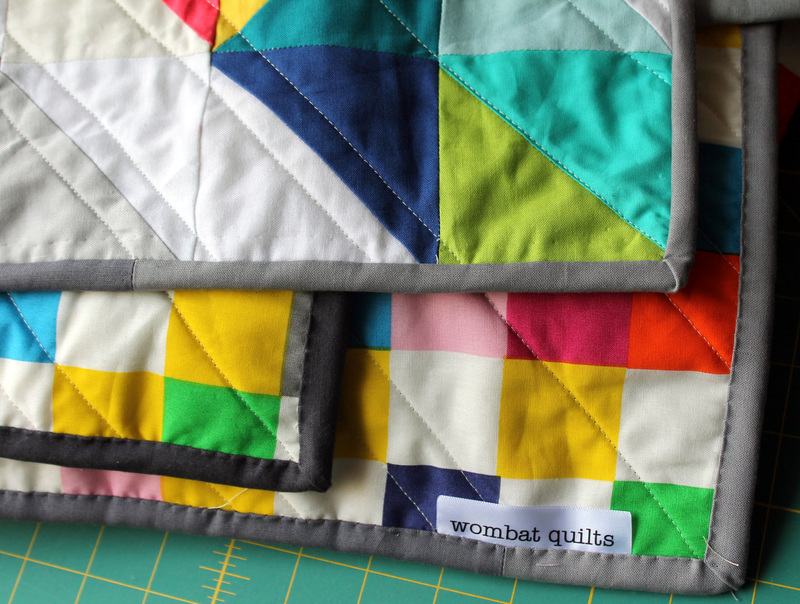 That is one lovely cheering upping quilt! Very smart-looking, as well as colorful. The alternating cool and warm colors give it a sophisticated look that many color explosions do not have. It’s a wonderful quilt. Congratulations! Wow, that’s truly gorgeous! Beautiful work! Love this! It’s an awesome quilt block. That is a beutiful finish! Well done! I love all those colors! Your quilt looks fabulous. I love how vibrant it is. I think the scrappy grey binding is inspired as well. It was worth the wait (and the effort!) Looks fantastic! What an excellent pattern to show off all your solids. The “Sparkle” in the title is very fitting, too. Love the backing. There’s nothing better than taking that last stitch on the binding, and yelling, “woo-hoo!” Congratulations on finishing! Such an elegant quilt! Excellent balance of colors and the restrained grays of the binding set it off so well. 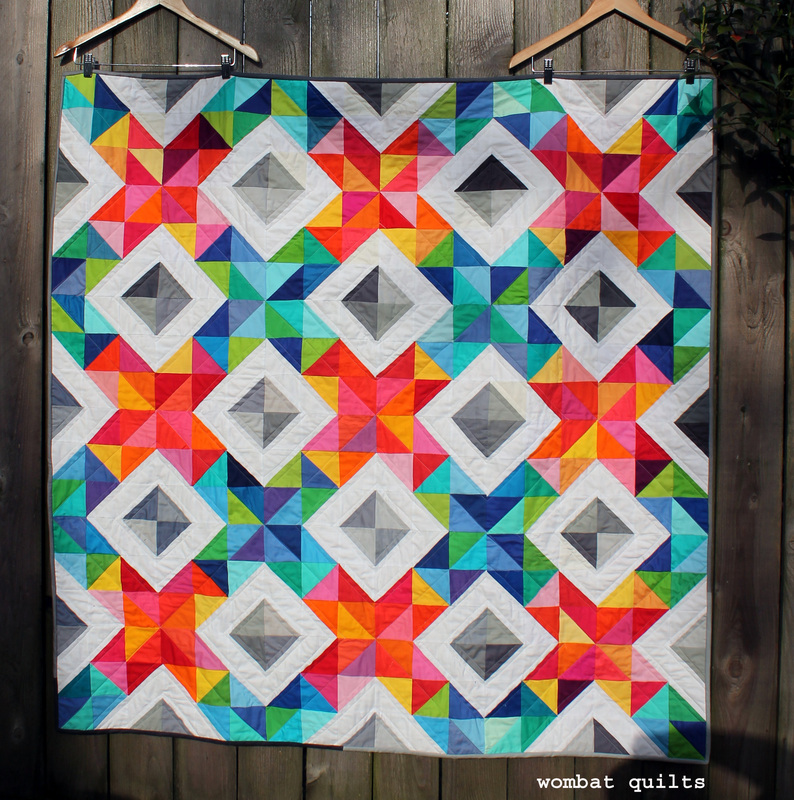 I was looking at some of the blogs I follow, and happened upon such an elegant quilt! It is so colorful, yet has an excellent balance of colors mixed with garrisoned white. Such great eye-candy, I wanted to share! If this was mine, it wouldn’t be going anywhere. LOVE it! Great design, gorgeous colour choices, and so worth the time and effort. This is really great! I love that you added more blocks. Those blocks are really big and intricate! Great colors! Now THAT is a FANTASTIC quilt!! Congratulations on the completion. Makes me happy just to look at it. You should wrap up in it any time you need a little cheering up. All I can say is WOW! That is beautiful! I swear, every time you post, I want to go make another quilt! Your work is amazing. Beautiful quilt! I really love the bright and bold colors, but the gray really grounds and balances it! Well done! What a stunning quilt. It was defintiely a great idea to add the extra blocks, the design really comes through beautifully as a result. Great choice of backing fabric. I’ve used Ikea fabrics in quilts and ofr quilt backs and more recently I’ve actually started purposely buying Ikea duvet covers that I like to have as quilt backs in my stash and love how well they work. Oh wow, the pattern is great and I love your beautiful interpretation of it! 😀 The warm/cool combo with the greys is really dynamic. Love! Really love this one. Fabulous rainbow colors that the grey offsets well. Great layout. Wow! I almost never work with all solids myself, but I might have to after seeing this. This quilt design with its warm and cool colors it just striking! From a “pillow maker”, Thanks for two sizes!!! I love this quilt! It appeals to my sense of order and love of scrappyness! And the backing fabric is perfect! So interesting, keeps your eyes moving. It’s impossible to fathom it all in a short look.